It’s official – Maltstock is Awesome. I mean, last year’s event was really, really good, but this year it kicked up a gear in every conceivable way. Having sung the praises of the event to Neil from Caskstrength, we decided to go to the event together, and resolved to deliver a masterclass on some of our favourite whiskies from closed distilleries. Having set off for the drive from Tunbridge Wells to Dover in ‘plenty of time’, we managed to miss the ferry like a complete pair of rejects (well, one reject, and an immaculately dressed man in Crepe Soled Shoes at any rate). Having secured passage on the next available ferry, we settled in at Dover for the wait. After what seemed like an eternity, our Ferry arrived, and we boarded. After ascertaining that there was nothing of interest in the Duty Free Shop, we repaired to shoot Zombies (we couldn’t find a ‘boy in care’ to help us out, and were consequently killed reasonably soon). On disembarking into France, we worked out that given the distance we had to travel, the time we had to do it, and the fact that we were prepared to get a bit of a wriggle on, we would probably be able to arrive at Maltstock on time, despite the fact that we’d been delayed by a full hour and a half by the Ferry Debacle. So, after all that, we arrived at Maltstock with just 12 minutes to spare before our ‘Lost Distilleries’ tasting was due to commence. After the fastest ever setup of 6 whiskies and 6 food pairings in history, we launched into, it has to be said, a fantastically successful tasting. Littlemill 1990 18yo (Murray McDavid) Bourbon Matured 53.5% – Paired with a Physalis, to bring out the huge tropical fruit notes from the whisky. Glenlochy 1980 30yo (Signatory) Hogshead 55.9% – Paired with a sweet and tangy Cashel Blue Cheese. Tamnavulin 1981 16yo (Master of Malt) 2nd Fill Sherry Hogshead 55.1% Paired with a more powerful Vintage Gruyere to emphasise the notes from the Sherry cask. Caperdonich 1972 38yo (Duncan Taylor) 53.6% Paired with some rather delicious smoked Parma Ham to bring out the notes of Subtle Smoke from the Whisky. Hanyu 23yo – Ichiro’s Malt 58% Paired with some Amazing Valhrona Caraibe Chocolate. And at the end, we presented the crowd a sample of a ‘mystery drink’, told them it contained whisky from a closed distillery, and asked them to guess what they thought it could be. Funnily enough, 8 or 9 people shouted out answers, and they all got it right. Guessed it yet? Yep – the final sample was of our much-famed ‘Brown Drink’, containing a total of 31 whiskies from closed distilleries, as well as over 500 other whiskies, rums, Cognacs and other spirits. We’ve still got about 10 bottles left at the time of writing, so if you fancy it – you can buy it here. This one was paired with some delicious Smoked Almonds, as, well, there’s quite a lot going on in the Brown Drink – and we wanted something that would stand up to the plethora of different flavours all jostling for attention. After the rousing applause at the end of the Tasting – which we maintain drowned out the hubbub from the Speciality Drinks tasting happening down the hall – we settled into our room with Jon Beach, Port Ellen Collector Extraordinaire, and custodian of the superb Fiddlers Whisky Bar on Loch Ness – it has to be said that we lucked out for the second year in a row with our room, managing to get a ‘4’ as opposed to being in the dorms. Forty Creek Confederation Oak Reserve – an interesting one this – matured in Oak purported to be from the time of the Canadian confederation. Typical Bourbon nose, but perhaps slightly sweeter? More than a hint of Peaches (tinned) on the palate. I have to say that this one way much more reserved than we’d initially expected. Definitely one to try though. White Horse 1960s bottling – an older version of the commercially available version (which we tried alongside it). Even in hindsight, this is a very strong contender for our favourite whisky of the show. Nose was all soft, buttery peat, but with a really rounded character. Put us in mind of a better Lagavulin DE release. Absolutely enormous mouth-filling fruit – huge, delicious, and with a seriously lengthy finish, where the soft peat makes a resurgency. Stunning, and puts the modern day equivalent to shame. It’s likely that this is composed of reasonably old Lagavulin, and Port Dundas Grain (with maybe a smattering of Linkwood from this era? Correct me if I’m wrong). After another couple of (non note-worthy) drams, we headed off for the evening’s entertainment – the now legendary Maltstock Quiz. We formed a team (We Heart Master of Speciality Whiskybase Squad) with Billy and Jason from The Whisky Squad (Billy also has another job I think – something to do with traffic cones?) and the guys from Whiskybase. Feeling perhaps slightly apprehensive, as there were only 6 of us in our team, against some other teams of 10 or more. After the first round, our confidence had taken a few knocks (if there’s anything geekier than a round called ‘stillspotting’ – I’ve yet to hear about it), but we came into our own in the second and third rounds, and by the time the first set of rounds had been marked, we were in the lead! Another round or two of 27yo Dailuane and a serious amount of conferring later, the end of the quiz was in sight. The final result? We came second by one point. One point. I tells ya’. After a few more drams, and absolutely nothing else happening, we went off to bed. Yes. Let’s switch the lights off. Let’s turn them off. How do you do that again? First Cask Highland Park 1974 – Nose all on fruit Salads (the sweets, not the good for you stuff you have with muesli). Touch of Heathery peat in the palate. Very good example of Highland Park, perhaps slightly tired cask, but I’m being picky. Wasmunds Single Malt Spirit and Single Malt Whisky – Another American Micro-Distillery, but looks like they’re doing it properly here. Spirit is very applewood rich. At first I was reasonably convinced I was picking up notes from the BBQ, but a bit of investigation on the bottle label reveals that the barley is actually dried over Applewood, so there we go. A very rich palate on this – loads going on – cattle feed? Onto the Whisky, and we’re simply tasting a carpenter’s workshop. Wood Glue, Varnish, Wood shavings it’s all here. Astonishing. Not exactly easy-drinking, but very interesting nonetheless. Blau Maus Schwarzer Pirat – Like eating banana strings. Deeply bad. 21yo Glen Grant (1970s Italian Market) Hugely Caperdonichesque (probably because it basically is). Meaty, Rich, loads of old-sherry rancio. Post-curry Armpits in there too. Maybe a bit crusty. In the afternoon, we were booked into a Benriach/Glendronach tasting. A fascinating insight into the upcoming products from this very progressive distillery. We sampled the new Benriach Horizons bottling, but the star of the show (for me at least) was a cask sample from a cask that was destined for the new bottling of Solstice, but by gosh this cask was a good ‘un. Nose: Effortless and fruity. Fruit salad sweets, waxy red apple and slightly perfumed pomanders. Palate: A perfect sphere of red apple goodness, rich sherry notes, some playful spiciness and fruitcake notes. Beautifully integrated. Finish: Becomes waxier, as time passes- classically Clynelish, with the red apple notes still performing well and Lebkuchen biscuits. Overall: A time capsule of a dram. Perfectly highlights just how good these bottlings are from a time recently gone by. Nose: Classic old Ardbeg swimming pool peat, wet skin, iodine and elastoplast. A nose you could live with for hours and hours, yet never tire of. With time, some slightly wood-smoked bacon notes come to the fore. Palate: More sweet-cured bacon, bonfire toffee notes, and a little milk chocolate, wrapped up in a waft of aromatic smoke. Finish: Hints of thick, tarry rope by the sea. Salty lobster pots. Absolutely mesmerising. Overall: And on the 7th day, the Lord created Ardbeg 1977. After these, it was definitely time for a well-earned nap, so off to bed we went. Arising refreshed a couple of hours later, we were served perhaps the best BBQ I’ve had since ‘that day’ on Islay… delicious Pulled Pork, Chicken, Sausages (although I’m going to use the term ‘links’ to best describe these), a red pepper filled with Spicy Beans, and absolutely ridiculously good tri-tip. If I’m honest, I think that maybe the one weak spot of last year’s Maltstock offering was the food on the Saturday night, but this had been remedied in absolutely spectacular fashion with undoubtedly the best commercial BBQ I’ve ever had. A solid win here. Musical accompaniment to the BBQ was provided in spectacular fashion by Jock Shaw and Jon, our roomie – their rendition of ‘Beer Drinking Woman’ was both timely, and apt. After a thorough Porkulation (a term coined by Jason, inbetween groans and the meat-sweats), we settled in for a few more drams before the culmination of Maltstock – the campfire. After the singing and story telling, it was time to set about that piñata we’d seen on the way down. The amazing Dr. Whisky – Sam Simmons – Balvenie’s Brand Ambassador, had brought along not one, but two of these piñatas stuffed with vouchers for whisky goodies, and a whacking great malt shovel to bash them to bits with. After another quick dram or two, it was time to make our excuses and slink off to bed at a frankly pathetic midnight (the courtyard was still being rallied by a round robin of Bohemian Rhapsody, American Pie, Wonderwall, and whatever else the guy with the guitar could play until about 06:30). The following morning, we roused ourselves, snaffled down a quick breakfast, and headed for the border. The way back was quicker, taking a shade over 3 hours thanks to the lack of traffic. After a brief interlude to have our passport photos laughed at (out loud) by the customs officer, we were on the boat again. That just about sums it up for me too to be honest. I visited your "Lost Distilleries" tasting and I loved every minute of it. Thanks guys for the effort and the great combinations of food and drams. Learned a lot from it, and I’m definitly going to experiment with the food with whisky concept myself. Cheers, and who knows, mayby next year we can share a good whisky again. I think you might have forgotten to insert the video (or the link to the video) in this post. Ok, here’s a list of what I saw and what I think I reckognized on the video : Hanyu 1988-2009 (Full Proof), Hanyu 1988-2008 (Full Proof), Hanyu 1990-2009 (Full Proof), Springbank private bottling for didtillery visitors (miniatures), Glenfarclas 15 yo (square bottle), Tobermory 32 yo, Dalmore 12 yo, Loch Dhu 10 yo, Oban 12 yo, Scapa 12 yo, Kilchoman (don’t know exactly which one), 2 Ardbegs (not sure which ones), Springbank 10 (ceramic), Macallan 12 yo Fine Oak, Glenlivet 12 yo, Clynelish 17 yo, GlenDronach 1992 (or is it 1982 ? ), Brora 24 yo, Campbeltown Loch, Bruichladdich Old 10, Lagavulin Feis ile, Port Ellen 25 yo, Laphroaig 15 yo, Laphroaig 10 yo, BenRiach 1984 (or is it 1994 ? ), Glen Mhor 10 yo, Longrow, Bowmore, Linkwood, Mac Dull, Glen Grant, and many Signatory Vintage and Cadenhead’s bottlings. anyone else got any guesses, or does Franck take the prize!? Many thanks for the Kind Words Rob – I’m glad we could teach you something about whisky and food – and hope we inspire you to try more! Okey-dokey then – I guess that Franck takes the grand prize of ‘all that robbed stuff’!
. 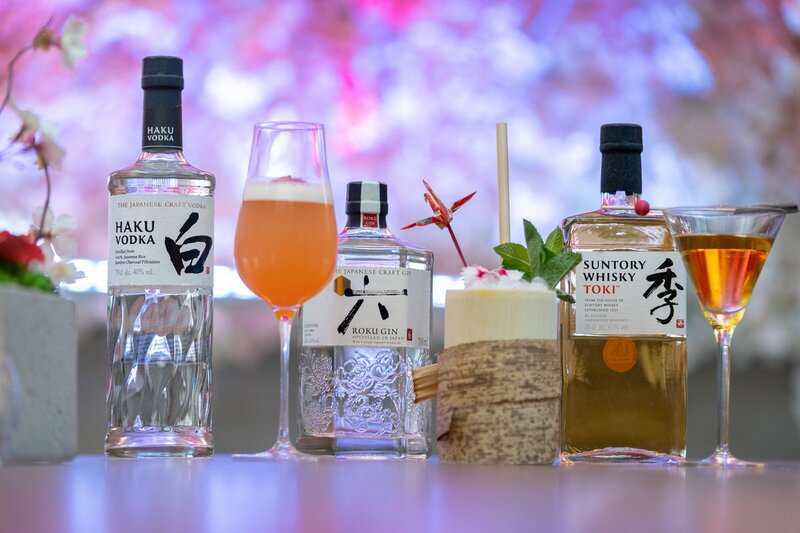 @SuntoryGlobal and Nobu Hotel London Shoreditch have teamed up to create a spectacular spring showcase with bespoke cocktail, dishes and even a spot of afternoon tea!